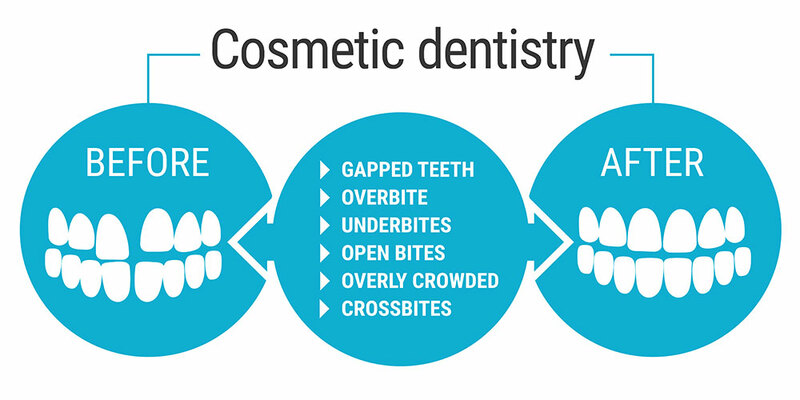 Using state-of-the-art cosmetic dentistry techniques, high-quality ceramic restorations, and meticulous dental work, our experienced dentists can transform the health and aesthetics of nearly any smile. Each smile makeover at True Dentistry is a custom-tailored masterpiece that is designed to complement your appearance, lifestyle, and personality. What Are My Smile Makeover Treatment Options? Porcelain Veneers – Reshape the smile, improve alignment, and conceal multiple aesthetic flaws simultaneously with thin shells of high-quality ceramic material that look incredibly natural. Invisalign® – Move your teeth into alignment with a series of comfortable, virtually undetectable clear plastic aligners. Laser Gum Therapy – Sculpt the gum line and/or remove excessive gum tissue to create a more balanced and attractive smile. Porcelain Crowns – Badly damaged teeth may require a porcelain crown, which restores the strength, structure, and appearance of each tooth. Teeth Whitening – Lighten stains/discoloration and brighten teeth several shades with in-office or at-home teeth whitening treatments. Cosmetic Bonding – Cover cosmetic concerns and make repairs with tooth-colored composite resin bonding. Tooth-Colored Fillings – Go from dark metal fillings to tooth-colored fillings that blend with your natural shade to create a brighter, healthier-looking smile. If you require more intensive treatments for more severe dental concerns, our dentists are experienced in state-of-the-art reconstructive dentistry. Our practice offers customized full mouth restoration treatment plans to rebuild the health, function, and beauty of your teeth. To begin the smile makeover process, your dentist will perform a comprehensive dental exam and discuss the changes you would like to make to your smile. Based on your need and goals, your dentist will explain the available options that can create the smile you desire. You will have the opportunity to learn about the advantages and drawbacks of each treatment so you can choose the approach that aligns best with your priorities, timing, and budget. Once you have selected a treatment plan, your dentist can start transforming your smile. For some patients the smile makeover process can be completed within the span of one appointment, but for those with more complex treatment plans, two or more appointments may be required. For those receiving porcelain veneers or crowns, the final restorations must arrive from the dental lab and then be fitted and bonded to complete the smile makeover. Do you have questions about how a smile makeover can improve your smile? We encourage you to contact our office to schedule a consultation with one of our experienced cosmetic dentists.